It is without a doubt that Dimas Guerrero Sr. has been San Pedro’s Top Artist. At a very young age when Dimas had just begun skin diving as a fisherman, he found some black coral and learned that it was a valuable coral. He commenced carving corals specializing in pendants, bracelets and necklaces. His great imagination let loose his great creativity and he produced stars, tear drops, sharks, dolphins, and more. At times he took special orders and ended up with big masterpieces like this black coral ship in this flashback. Dimas also worked with conch shells, turtle shells, conch pearls, and other marine materials. He painted on canvas, T-shirts and murals. Finally Dimas went into gold and silver combining them with corals and shells. 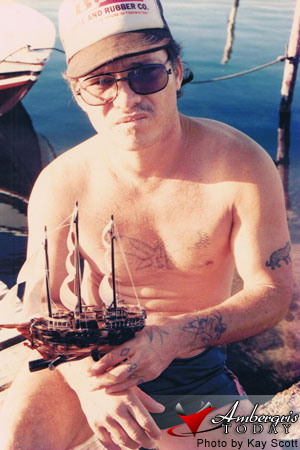 As you can see with his body tattoos, Dimas was also a tattoo artist, who started making his own ink using black smoke and soot. Hats off to San Pedro’s All Time Artist.